WANDSWORTH ARTS FRINGE IS TEN! Tickets are on sale for Wandsworth Council’s premiere arts festival as it rockets into its second decade. To celebrate this landmark birthday, #WAF10 highlights ten projects which celebrate the artists, companies and organisations that have been part of been part of WAF’s first ten years. These are the people who transformed the month of May in the London Borough into a melting pot of creativity, of dance performances, of cutting-edge comedy, theatrical delights, breathtaking circus, supercharged music and life-affirming outdoor arts. The #WAF10 programme is a distillation of the work that WAF has presented for the past decade and continues to present this year. The thrilling and varied programme of art, with many performance being free, means that there is something for everyone and sums up why Wandsworth Arts Fringe has become a showcase for the very best work around. WAF’s tenth anniversary blasts off with a high-octane fusion of dance, music and circus by Cirque Bijou! Just a five minute walk from Clapham Junction, this show-stopping spectacular opening of WAF10 is free and open to all. ActionSpace is a London based visual arts organisation that supports artists with learning disabilities and creates innovative projects for people with learning disabilities to engage with the visual arts. Vital Mix is a series of ActionSpace events, exhibitions and happenings for Wandsworth Arts Fringe, taking place across the borough. ActionSpace artists Lasmin Salmon, Chandrakant Patel, Roland Young and Robin Smith present a group exhibition of textiles, painting, drawing and projections. A live drawing event. Claudia Williams will take over Johann Arens’ installation, creating a series of unpredictable visual mash-ups. Immersive and experimental film projections exploring movement, materials and shadows by artist Mark Lawrence. Previously based in Wandsworth, TheatreN16-Eastlake Productions is a partnership of theatre-makers committed to supporting burgeoning artists, companies and theatre professionals in creating new, inspiring work. Returning to Wandsworth for #WAF10, TheatreN16-Eastlake Productions take up residence in The Cat’s Back pub with a cutting-edge programme of theatre, comedy and performance, ranging from the powerful to the absurd. Your Aunt Fanny is an all-female comedy sketch group made up of young women from the North East of England. Their new show Minge Unhinged celebrates all things fabulous, ridiculous and thoroughly inappropriate. Join Eleanor Colville for her show Google Me, as she browses through browsers and search histories for an hour of characters, sketches and some real dark-web material. As seen and heard on BBC Radio 4 Extra and BBC Three, this is a one-woman character comedy created from the characters we meet online. Award-winning partnership of performers Fragility return to WAF for their fourth year running. Fragility Takeover has become a core part of WAF’s identity, bringing in touring artists from across the world and providing a platform for local stars. Inviting exciting, experimental work to Wandsworth, Fragility’s programme brings The Arches under Putney Bridge to life, with a selection of the best in Fringe theatre, comedy, cabaret, and everything in between! As part of Fragility Takeover, Aspies Anonymous comes to The Arches. The Stealth Aspies are Britain’s first entirely autistic theatre company. Intimate and enlightening, their show explores autism in a light-hearted and truthful way, combining verbatim testimonies with original poetry, from those diagnosed with Asperger’s Syndrome (aspies) and autism in later life. Expect total fabulousness, pure joy and the freshest fierceness this Wandsworth Arts Fringe with Drag Syndrome, the world’s first drag troupe of queens and kings with Down’s syndrome. Award winning comedian and clown Elf Lyons presents a surreal tale of love and loneliness in her show Love Songs to Guinea Pigs, in the style of a 1980s Elton John rock concert. Challenging accepted definitions of theatre and audiences, Oily Cart create innovative, multi-sensory and highly interactive work for the very young and young people with multiple and complex disabilities. For #WAF10, Oily Cart has created tactile, sensory wonderlands for children with complex needs to play, discover and relax with their friends and families. Hidden Heathbrook is WAF’s best kept family secret, hosting a day of exciting outdoor art just around the corner from Wandsworth Road Station – and all for free! Bring a picnic and enjoy a full day of fun and creativity. Join us for a circus puppetry show by Hikapee Theatre, kite-making workshop led by Puppets with Guts, and create a giant, interactive world of tunnels, boxes and towers as part of WildCity’s Big Art Picnic. Look out for Bureau of Silly Ideas’ flying custard pies! A pop-up Lounge with incredible upcycled arts and guerrilla crafts for all the family. Come and chill, be entertained and inspired from the comfort of our outdoor sofas! For WAF’s 10th anniversary, Emergency Exit Arts are bringing back their much-loved collaborative space – filled with curiosities and hands on making experiments to fuel new ideas and stimulate the senses. F.R.E.S.H. Studios have concocted an impressive programme of events by some of the UK’s leading Black choreographers: an open discussion about the redemptive power of dance with Bawren Tavaziva, an interactive live performance by Akeim Toussaint Buck, a popping and mindfulness masterclass with Robert Hylton, and a series of free dance classes delivered by top local companies such as Ballet Soul. Throughout May, Tara presents an inspiring programme of theatre, dance, music, film and comedy by women artists. I’ll Say it Again! is the fierce and unapologetic celebration of women’s voices, through theatre, music, comedy and dance. I’ll Say it Again! is a sharing in the best sense of the word – humourous, moving and empowering. Wandsworth Arts Fringe is delighted to boast a number of shows as part of I’ll Say it Again!, including terrific young writer Nyla Levy’s acerbic new play, Does My Bomb Look Big in This?, and as seen on BBC iPlayer, Zahra Barri’s Special – Zahra’s comedy with an edge looks at ego, self-image and narcissism. She doesn’t think she’s special, so why does everyone else think that they are? Dash Arts returns to The Bedford to close #WAF10 with a celebration of the exceptional European artists living and making work in London. Featuring short films, family-friendly workshops, invigorating conversations, mind-bending comedy and a floor-stomping gig! The day of exciting programming will include Stand-up Comedy in collaboration with the Eastern European Comedy Festival, and fabulous European stories and myths for children with actor, writer and comedian Erin Hunter. Heaps of fun: magical adventures, interactive stories, drama games galore, playful characters and role play. Plus a sprinkling of songs on the ukulele, creative movement and some nifty props and costumes. Visit wandsworthartsfringe.com to browse the full programme of over 150 events and book tickets. Wandsworth Arts Fringe is brought to you by Wandsworth Council in partnership with Enable Leisure and Culture. In 2018, 98% of our audiences rated their WAF experience either excellent or good. A key part of Wandsworth Council’s arts and culture programme, WAF brings together over 700 creatives in an array of nooks and crannies throughout the borough – some indoor, some outdoor, and some truly unexpected – revealing a Wandsworth you never knew existed. The festival is emphatically inclusive and welcomes participation from artists across all art forms, including street performances, exhibitions, comedy, theatre, music, dance and everything in between. 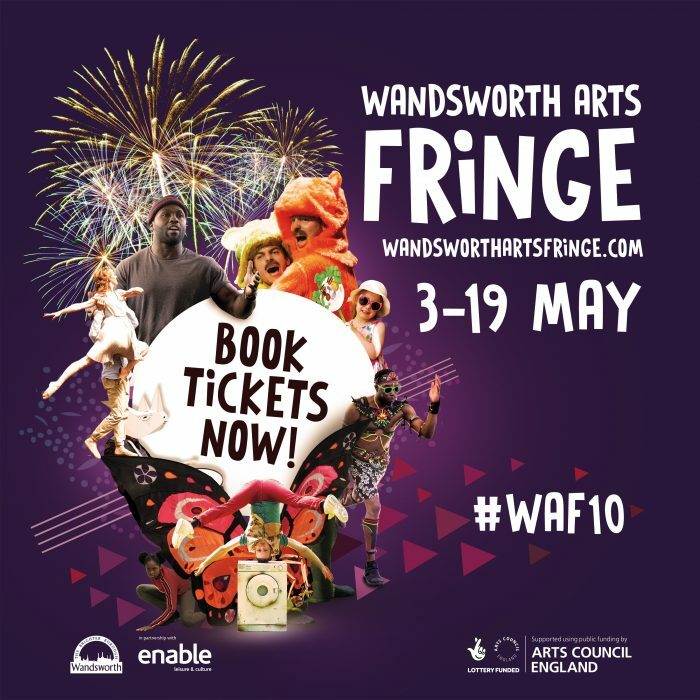 WAF is produced by Enable Leisure and Culture on behalf of Wandsworth Council using public funding by the National Lottery through Arts Council England. Wandsworth Council has been supporting the festival since its outset. Wandsworth Council is proud to support the borough’s cultural infrastructure and ensure that all residents have access to quality creative activities. Through Enable Arts Team, Wandsworth Council ensure the delivery of cultural infrastructure support and a high quality arts and culture programme that is accessible to all residents, businesses and visitors to the borough. Please use the Wandsworth Arts Fringe programme and visit wandsworthartsfringe.com to see the full listings and the new accessibility features, which aim to guide you through the festival events. For all the latest information, insights and updates follow WAF @WAFfringe #WAF10 on twitter and @wandsworthartsfringe #WAF10 on Instagram.